Our scientists use a combination of externally licensed and internally developed computational and modeling tools to achieve their goals. Internal development at BioPredict focuses on problems for which commercial software is unavailable, inadequate, or inappropriate in scale for modern high-throughput drug discovery. A key focus at BioPredict is the development of methods that allow the full spectrum of available information to be brought to bear on a problem. Utilizing multiple structures on related targets within a protein family is the motivation behind Comparing Active Sites within Protein Families. 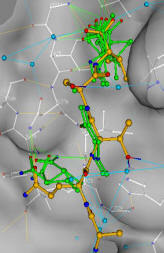 Merging structural information with medicinal-chemical information is the motivation behind Hypothesis-Driven Docking and Enhancing Results of Virtual Screens Using Data Mining Techniques (links below). Using all information from a high-throughput screen - both positive and negative - is a motivation behind QSAR Analysis and High Throughput Screening Interpretation. Imprecise and/or incomplete data is a hallmark of typical problems encountered in drug discovery. To be meaningful models should embrace these aspects of their input and phrase their output appropriately - i.e. statistically. This is the motivation behind our current development of statistical ensemble-based approaches to docking, ab initio design, pharmacophore derivation and search, and 3D peptide-library profiling that uses the mathematical framework of Markov Random Fields. The methods embrace uncertainty in input, by for example enabling simultaneous statistical docking against ensembles of protein conformations. The methods frame their output statistically, by providing ensembles of solutions enriched for the likelihood of activity. The incremental cost of success when testing a small ensemble of compounds far outweighs the potential cost of failure when testing a single compound.